The unique fail safe design of the RE™ type disk assures the disk cannot be installed incorrectly in the safety head as the disk will burst at its rated burst pressure in either direction. 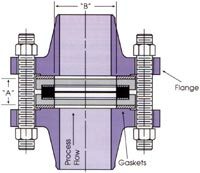 Additionally, the disk and safety head assembly may be installed in either direction between pipe flanges. A disk with a burst pressure of 22psig (1.52 bar) or above will withstand full vacuum.